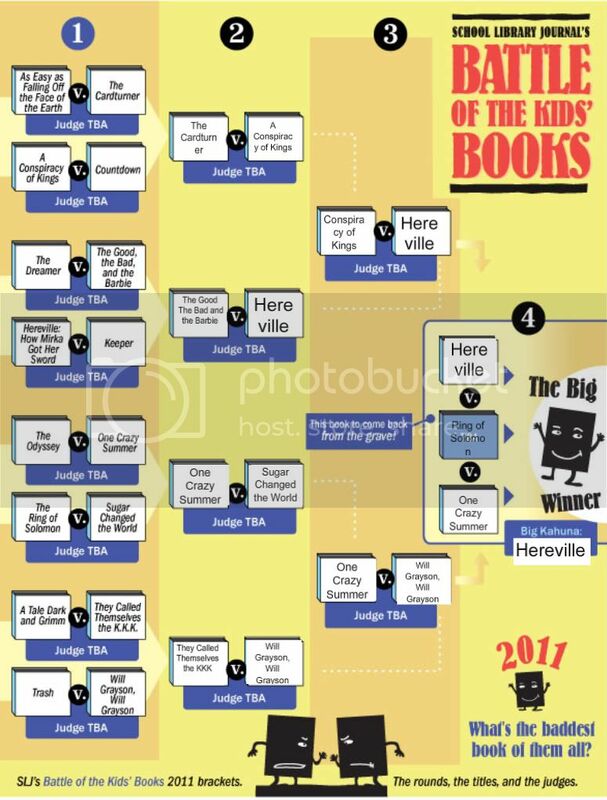 Okay, titles have been announced and the brackets are up for School Library Journal's Battle of the Kid's Books! Some might say it's a little early to start making predictions, especially because the celebrity author judges have not been finalized yet, and that could really be a game changer, but I'm going to go ahead and make my guesses anyway. There are so many books on the list of contenders that I haven't read, but you know, that just makes the guesswork more fun. Round 1 is probably full of some of my riskiest bets, so, if I'm wrong, I'll be really wrong later. For example, why did I say The Cardturner will beat out As Easy as Falling off the Face of the Earth? Only because I've read The Cardturner, and even though it wasn't my favorite, I've never heard of the other book. On the other hand, Hereville: How Mirka Got Her Sword vs. Keeper is a really, really close call. I think One Crazy Summer will do very well... that's why I think it will make it to the finalists. I hate that there's a book that could come back from the grave! Once a book is eliminated, it should be done. I don't want a book to randomly make it to the top. I'm rooting for The Ring of Solomon enough that I felt bad for predicting it's elimination in Round 1... which is why I gave it a second shot by putting it in the "back from the grave" slot. Honestly, if it does come down to Hereville vs. One Crazy Summer that could really go either way. I chose Hereville for my final winner, because it deserves some recognition! Thanks! I'm going to have to completely change all of my guesses now that we know who the judges are. This changes everything!